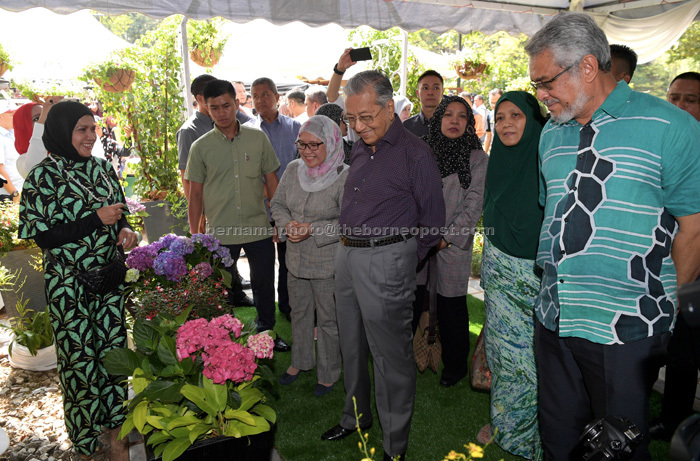 PUTRAJAYA: Prime Minister Tun Dr Mahathir Mohamad wants effort to beautify the landscape around the house, village and towns to become a culture and the interest of society, to turn Malaysia into a beautiful garden country. He said Malaysia was bestowed with good weather and fertile soil which facilitated effort to plant numerous plants and flowers and this advantage should be used in the best possible manner to beautify the national landscape. Dr Mahahir said town planning too must be conducted in an orderly manner by taking into account the layout of the same types of buildings and the selections of suitable trees to beautify landscapes and garden. “There is an impact if a certain area is left open, so that we can plant trees and it is not left just like that. In addition, focus on the beauty of trees that are planted along roads and build places for residents to rest on weekends,’’ he told a media conference after launching the 2019 National Landscape Day at the Botany Garden here yesterday. He said trees here grew very fast and reached a one-and-a-half feet diameter in less than 20 years. In the meantime, Dr Mahathir also chided the activity of painting grafiti on the walls of buildings with meaningless words which tarnished the view. “But if you want to paint the wall nicely and beautifully as the background of the road, then it’s nice. “You can also paint real pictures. “I am not opposed to the painting of my picture (on a building wall) in Alor Setar. That is ok, but when they start to smear, that is not good,” he said. At the event, which was also attended by Federal Territories Minister Khalid Abdul Samad, Dr Mahathir also handed out several awards in the forms of grants to communities, developers and local authorities which successfully planned and implemented comprehensive landscape managements. Kuala Lumpur City Hall received the main award under the Garden Nation Initiative involving a RM1 million grant while the Putrajaya Corporation and the Iskandar Puteri City Council each received grants of RM500,000 and RM300,000, respectively. The National Landscape Day was initiated in 1998 on every March 3 aimed at mobilising a culture of love for landscaping among the people in line with Core 1 of the National Landscape Policy, namely, to popularise love for landscaping. Held for the first time here, the celebration this time took place for three days from Friday with the theme ‘’The Most Beautiful Garden Nation, Malaysia’’.